Begin your day with breakfast on the front porch. 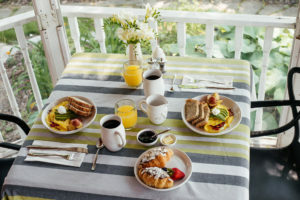 We offer a fully cooked, hot, gourmet breakfast. Most of our ingredients are local, organic or both. Mark worked in the hotel & restaurant industry for 15 years before becoming a B&B owner & he has a passion for cooking. 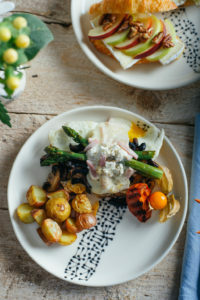 In fact, Breakfast is his favourite meal to prepare and enjoy. Plus you’ll enjoy your delicious meal even more when it’s served on Melanie’s handmade ceramic dish ware. Coffee also tastes better with one of Melanie’s hand thrown mugs. If you have any dietary restrictions, please let us know ahead of time & we’d be happy to prepare a breakfast just for you. Gluten-free, vegan, meat-lovers & more – all are welcome. 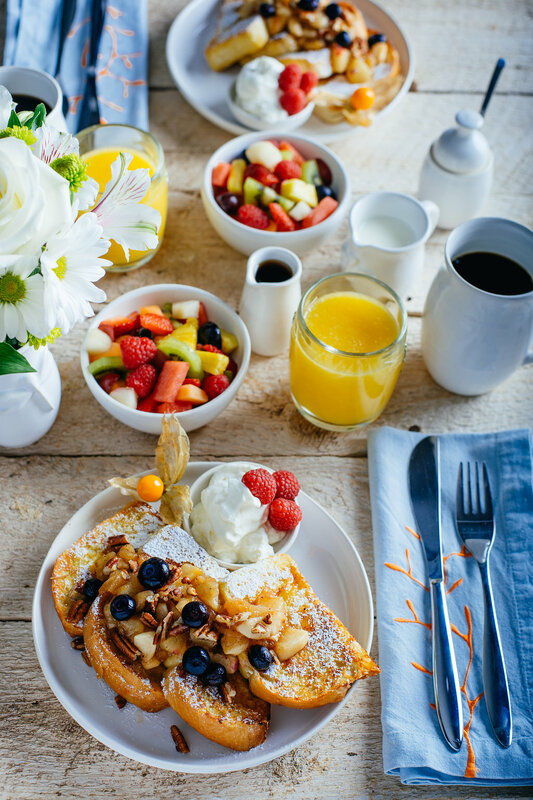 Breakfast starts with fresh fruit, juice, coffee and a selection of teas. The main course varies from day to day and may include one of the dishes listed below. 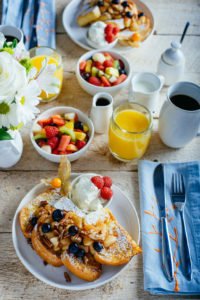 Butter topped french toast with fresh made fruit compote, local maple syrup, whipped cream and sprinkled with toasted almonds. The fruit compote varies from mixed berry to apple & pear, depending on the season. Fresh eggs, seasonal vegetables, Black River cheeses served with artisan bread & local jam. Our version of a Dutch Breakfast includes avocado wrapped with either smoked salmon or oven smoked ham, Gouda cheese, boiled egg, breakfast cake, Dutch rusks with sprinkles, toast, croissant and preserves all served tapas style. 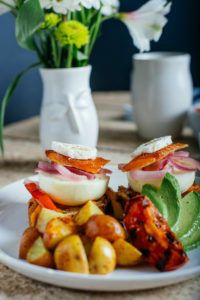 Two eggs poached to your liking, served on cheesy toasted bread and topped with avocado, smoked, candied salmon & goat cheese. Light and fluffy, made with fresh eggs, seasonal vegetables and local cheeses. Served with artisan bread & local jam. Homemade waffles topped with saffron poached pineapple, toasted coconut & fresh mango. Served with a mini bowl of fresh whipped cream & warmed, local maple syrup. One egg cooked sunny side up, served on top of a toasty filled with local cheeses. With grilled, local asparagus & bechemel sauce.